Watch 'em disappear! 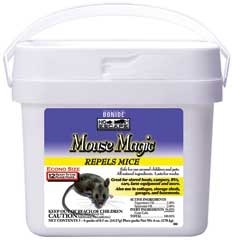 The All Natural ingredients in Mouse Magic triggers escape/avoidance behaviors in mice driving them from homes, sheds, patios, etc. This unique new method of rodent control combines the effectiveness of natural essential oils with the convenience of place pack technology. Simply locate the place packs, which exude the repelling quality of essential oils, anywhere mice enter, feed or nest. Not for sale in KY.